Now that I'm sure Maggie is our last girl child and Jack is our last boy child, I'd love an attractive container like this to collect outgrown clothes in. If I put it in the laundry room on top of the dryer, I could just toss in the things I know they've grown out of as I take them out of the dryer, instead of folding them and putting them away, where Maggie will ask to wear them once again, or someone will try and cram poor Jack into something too small. 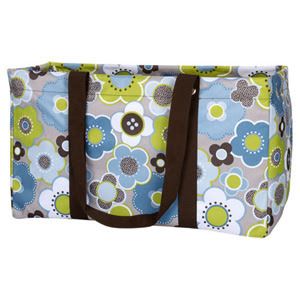 Something like this Large Utility Tote from Thirty-One Gifts would be pretty and practical, and save me a lot of seasonal sorting to get rid of old clothes. As the tote filled up, I could bag them and pass them along to hubby's co-worker whose wife is always collecting things for the charity where she works.